The real customer value of AV/IT convergence is in simplifying infrastructure. Having a single network to install, manage and maintain has huge implications on a system’s total cost of ownership. Today’s 1 Gbps networks do not have sufficient bandwidth to enable true convergence of IT and AV systems, while maintaining video quality with tolerable latency. Of course, priority can be given to AV network traffic, but this results in a painful IT user experience (slow file transfer times and unresponsive browsers). Similarly, giving priority to the IT traffic results in poor and unpredictable video quality due to the need for heavy compression and the impact of bursty IT traffic at inopportune times. Higher compression also leads to higher latency. These challenges are compounded further with the adoption of higher resolution video such as 4K. Most IT departments will simply not allow multiple AV transmitters, consuming hundreds of megabits per stream, to be added to existing IT systems running over a 1 Gbps network – and for good reason! The users of the IT network expect that nearly all the 1 Gbps bandwidth is available to them for file downloads, collaboration and even PC and mobile video streaming. If the AV system starts consuming most of that bandwidth, the IT experience is significantly compromised. Some manufacturers that tout the benefits of 1G networks design products that consume 990 Mbps – that’s 99% of the entire network bandwidth dedicated to a single video stream. It’s no wonder convergence is unachievable with these systems. Integrators, IT system administrators, and even 1 Gbps video product manufacturers have already realized this, so standard practice is to create two parallel networks. A physically independent 1 Gbps network dedicated solely to the AV traffic is built alongside the pre-existing 1 Gbps IT data network. This completely defeats the objective of convergence and even negates some of the cost benefits associated with networked AV. Given the rapid growth and deployment of 10 Gigabit Ethernet infrastructure and products, and their constantly decreasing cost, upgrading to a 10 Gbps data network is the most effective way to increase network capacity. Using this class of network, HDMI video can be transmitted with little to no compression, and a full 1 Gbps (or more) can be set aside for IT network requirements. IT user experience is completely unaffected by the addition of the AV network equipment, while no compression means no latency and no compromise of image quality. Based on fundamental Ethernet technologies, 10 Gbps equipment can be interconnected to an existing 1 Gbps network, allowing the existing 1 Gbps infrastructure to function as it always has, while the 10 Gbps expansion is only needed where capacity for high quality video is required. 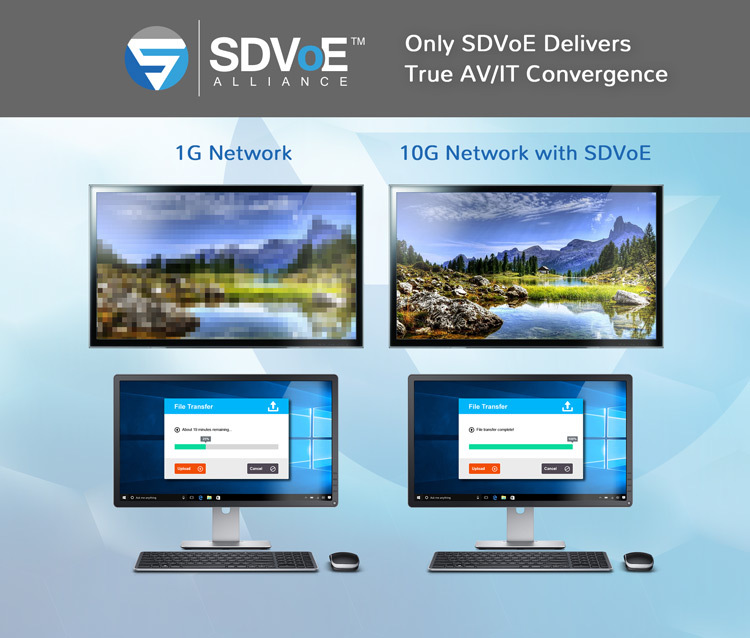 Designed from the ground up to take full advantage of 10G infrastructure, only SDVoE technology can deliver true AV/IT convergence, with the zero-millisecond latency and flawless image quality required in pro AV applications.